It's never been so affordable to quickly and efficiently charge your electric vehicle. 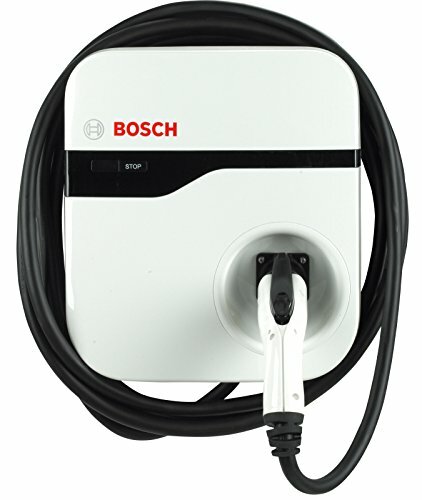 Utilizing Bosch expertise in household appliances and automotive solutions, the Level 2 EV Charger 240 Volt charging station is UL-certified and is designed to safely charge electric vehicles. Level 2 EV Charger is one of the perfect solutions for all indoor and outdoor electric vehicle charging needs and can be either wall or pedestal mounted. The Level 2 EV Charger is a hard wired and comes with a 25 foot SAE J1772 connector/cable. The unit dimension is 16 inch long x 14 inch wide and is 5 inch deep and weighs 17 pounds. Specifications: Amperage - 30 amperes, voltage 208 VAC to 240 VAC, input/output power 7.2 Kilowatt, input current 30 amperes, breaker size 40 amperes, temperature rating -22 Degrees Fahrenheit to +122 Degrees Fahrenheit and is NEMA Type 3R indoor/outdoor rated. Compact and sleek design, charges any vehicle meeting the SAE J1882 standard. Charging stations are cUL and UL listed and meet or exceed NEC 625, SAE J1882 and weather-resistant NEMA 3R enclosure for both indoor and outdoor installation.